I realized the other day that so many of our couples are high school sweethearts and I think that’s such a true reflection of WHO our couples are. Best friends who fall in love young + grow old together. Move on over, Nicholas Sparks, you seriously have nothing on our brides or grooms. Maddie, of Otte Style, a well known fashion and life style blog here in Kentucky, + her fiance, Sam, met in high school through mutual friends + exchanged phone numbers with one another on MySpace. They have been together for nearly a decade. They have been to homecomings, proms, + graduations together. They have been on mission trips together out of the country. 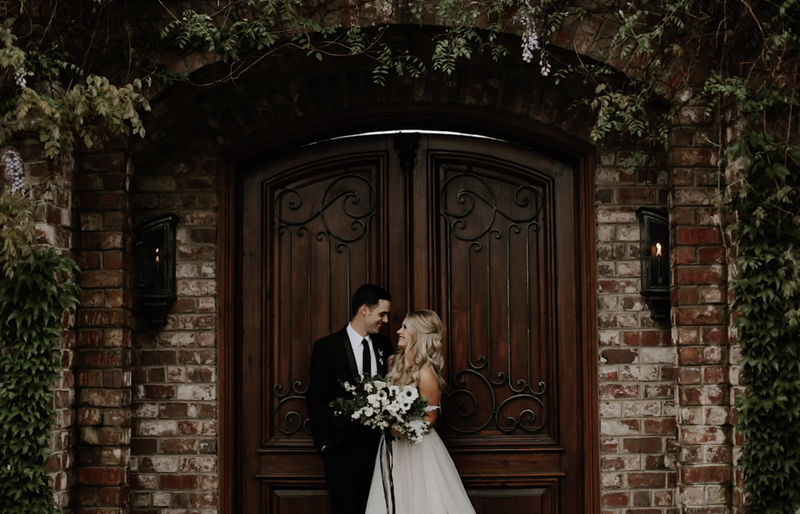 They have stayed together through college classes + stints of long distance + sooo many other changes that come along with growing up + entering the “real world,” but like so many people mentioned on their special day...the one thing that always remained constant throughout the years was the two of them — Maddie + Sam. These were the words and phrases that we kept hearing being used by SO MANY people to describe the character of both Maddie + Sam. Just two of the most genuine, thoughtful, down to earth kind of people. Those words stuck with us throughout the rest of the day as we watched Maddie + Sam interact with one another and the people they call their family and friends. We truly saw their genuine “goodness” shine through every single fraction of their day. Whether they were being troopers in the pouring down rain (seriously you all, TROOPERS, these two were), loving on their sweet black lab, Beau, dancing with all of their friends on the dance floor, or being loved on by the hundreds of people who came to celebrate with them. You know those people who just evoke JOY and bring so much LIGHT to the world? Maddie + Sam are, without a doubt, two of those people. We felt so honored to get to work so closely with their incredible team who put their WHOLE hearts into their work, creating + bringing Maddie's visions to LIFE even better than we imagined. Maddie chose a top notch team: from their incredible wedding planning + design team Shelly Fortune Events, to their talented photographer, to their incredible hair and make up artists, to their team of florists with Amy Osaba Events, to the most perfect garden venue nestled here in the middle of the city of Lexington, Kentucky. The Apiary is truly like a secret garden + a gem of a venue to have right here at home. Maddie + Sam handpicked every single vendor with so much thought + care, and because of that, they were able to have the wedding of their dreams with zero worries.